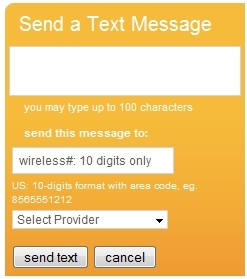 Reader Joe recently sent in a tip for a free cell phone text alert service called Text Reminders. Simply enter in your reminder message, a date and time for it to be sent, and you’re all set to be alerted via text message. The service is provided via a free sign-up and supports all of the major carriers out there (over 20 carriers supported). If you’re not looking to get alerts, but want to send texts on the cheap, check out HOWTO: Send Free Text Messages Through Email. For you web developers out there using Windows, you might not know that you can run both IIS (for .NET) and Apache (typically on Linux) side-by-side on Windows. IIS comes with XP Pro and Vista, but a lot of people don’t know that you can still leverage Apache as a web server. I personally use it for PHP and MySQL, so… alas, WAMP: Windows, Apache MySQL, PHP. First, download Wamp. Now install; a good spot is c:\wamp. By default, a web server runs on port 80. If you’re running IIS, it’s probably running on port 80 and Apache tries to as well. Let’s change it so Apache runs on port 8080. That’s all you really need to get things started. Don’t forget to restart the services every time you change the httpd.conf file. To allow other people on your network to see your sites running on Apache, all you need to do is it clikc the WAMP icon in the systray and click Put Online. It will restart the services and make your sites visible to others. This setting is necessary if you’re on an actual live server environment. And that’s about it. Do you have any more tips? Leave them in the comments.